This lesson describes model parameterizations of surface, PBL, and free atmospheric processes. It specifically addresses how models treat these processes, how such processes can potentially interact with each other, and how they can influence forecasts of sensible weather elements. Topics covered include: soil moisture processes, radiative processes involving clouds, and turbulent processes in the PBL and free atmosphere. THE FINAL QUIZ ON THIS INFORMATION WAS TOTAL GARBAGE. THE MAJORITY OF THE INFORMATION IN THE QUIZ WAS NOT EXPLICITLY STATED, AND 100% SET THE STUDENT UP FOR FAILURE. THE MATERIAL IN FUTURE QUIZZES NEEDS TO BE REFLECTIVE OF THE MATERIAL ACTUALLY PRESENTED IN THE LESSON. ADDITIONALLY, THE LESSONS THEMSELVES WERE VAGUE AND UNHELPFUL.THIS MODULE IS USELESS. Interesting case study and nice learning format which encourages participation and thinking, active learning. Identify effects that are smaller than NWP models can emulate (e.g. variations in surface characteristics that are smaller-scale than the NWP model resolution). Cite situations where physical processes are important to the model forecast relative to dynamical processes. 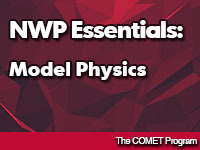 State how basic radiative transfer processes are parameterized in NWP models, and which forecast parameters produce the largest source of errors. State situations in which cloud structure and soil moisture parameterizations will work well, and those where they will work poorly. Cite situations in which at least two physical parameterizations will interact with each other, and the potential feedback effects. Identify at least one consequence of errors in model physics (cloud structure and soil moisture) on model forecasts at and around a forecast location. Identify at least two elements of NWP model surface parameterizations that affect surface/atmosphere exchanges and their impacts on the PBL. 11/15/2016 Checked on poorly performing quiz questions. Changed questions 11, 12 and 14 with Mick's help.